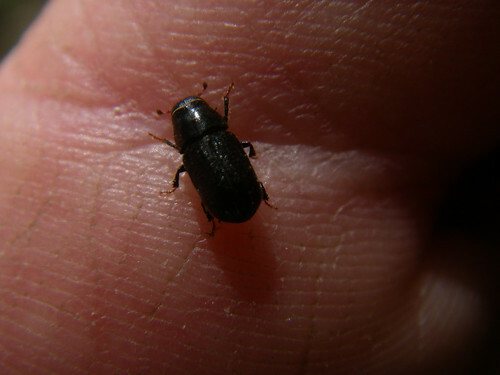 This is the third and last part of the Mountain Pine Beetle epidemic series. If you are just tuning in now, no worries, there is a bit of interesting information here. I would like to give another shout-out to the JCTC Biology instructor by name, but I cannot quite recall his name (it may be Burke- not sure), so if someone knows it, please tell me, so that everyone in the blogosphere will know about his good work and dedication to prison education. I think his wife may also be involved in prison work as well. That inmate education for nonviolent Class D Kentucky offenders is being eliminated is tragic. I wonder what the rationale is for eliminating education, treatment and job skills training and ability to exit incarceration with vouching work references in hand is. Class D nonviolent offenders will be released into the community. As a member of the community, what would you prefer: an educated person, with references in hand, who is excited about turning the second half of her life into a positive, or a warehoused, traumatized person who has spent several years on the cement floor of an overcrowded jail cell learning a new criminal skill set? note: Frog Gravy is a nonfiction incarceration account in Kentucky. Rocky Mountain Vista by Krossbow on flickr under Creative Commons. boreal– of or pertaining to the North (think Aurora Borealis). Forest areas of the North Temperate Zone. endemic-of animals. Prevalent in a particular region. pandemic-epidemic over a wide geographical area. silviculture– the cultivation of forests. carbon sink– a natural carbon vacuum or reservoir. defensible space– The area around a structure that is treated or cleared, to reduce or slow a fire. verbenone– a “no vacancy” pheromone sign. chlorotic– yellowed or brownish red due to diminished chlorophyll and cell death in leaf tissue. As atmospheric CO2, in parts per million, rises, so does the earth’s surface temperature. This, in turn, leads to drought and stresses trees, making them more susceptible to infestation. Killed trees then become a fire-prone fuel source, susceptible to intense-heat fire. In cyclic fashion, more fire leads to more CO2. The Canadian Forest Service no longer lists its huge forests as a “carbon sink,” because at the moment, the opposite is true: they have changed from natural carbon vacuum (sucking up 55 million tons per year) to producer (245 million tons per year). In terms of forest management, who or what caused the current forest decline is irrelevant. Nature is taking its course without regard to political views. Since humans are an integral part of our North American forest ecosystem, forest management is a necessary and responsible activity, and not a waste of time or money. 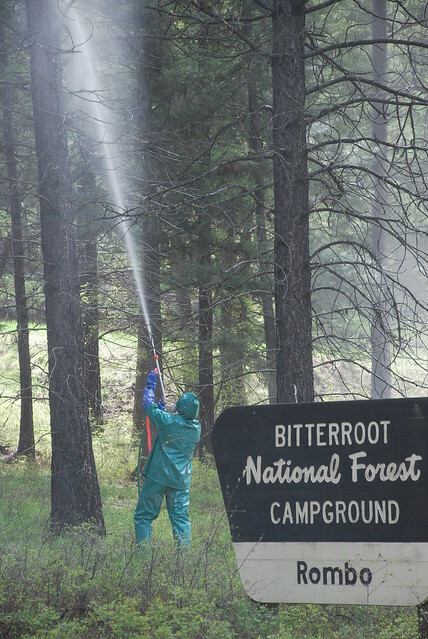 Any cascading event such as a forest beetle pandemic will affect current and future timber and recreation industries, raise safety concerns, and motivate further study. US government grants to the US Department of Agriculture, US Forest Service, can promote meaningful research and forest management. Since no known activities will stop the natural course of the current outbreak, we may need to accept the fact that our future forests will reflect a radical shift from past decades. With that in mind, damage control, safety and public education are primary objectives. -management and rules for temporary roads and trails, to prevent civilian misuse and injury. -thinning and reducing fuel load. -putting blue-stained wood to use. -continued study, data collection and evaluation. Ironically, “beetlewood” has created a temporary sawmill industry boom. Beetles have killed so many trees that some officials have “more than doubled their allowable timber harvest” (Struck, Washington Post). This economic industrial boost will ideally lead to long-term balance and consistency, for environment and industry alike. Campbell, N., Mitchell, L., Reece, J., Biology Menlo Park, CA, 1997. 38.13, Carbon dioxide and other gases added  to the atmosphere may cause global warming. Amman, G., McGregor, M., and Dolph, R., Mountain Pine beetle. Forest Insect and Disease. US Department of Agriculture, Forest Service, “Forest Insect and Disease Leaflet.” 1990. Marcus, N., and Halford, M., Our Future Forests 2008 Guide for the landowner. NW Colorado Forest Health Guide, 2008. US Department of Agriculture Forest Service, Record of Decision, Vail Valley Forest Health Project, March, 2006. Brown, J., Report: Warming cuts trees’ life in half. 1/23/09. 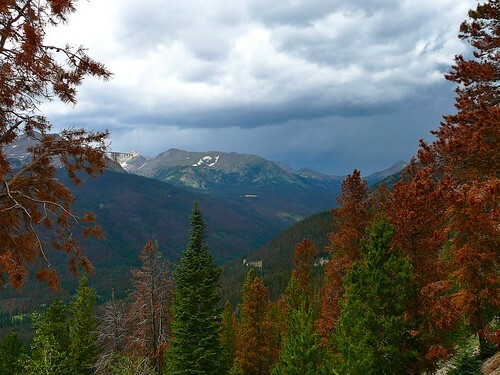 Bentz, B., Western US  Bark Beetles and Climate Change. May, 2008. US Department of Agriculture, Forest Service, Climate Change Resource Center. Fox, M., Pine Beetles May Affect Climate Change- Study. April 23, 2008. Struck, D., ‘Rapid Warming’ Spreads Havoc in Canada’s Forests. March 1, 2006. Clayton, M., Carbon Sink Springs a Leak. March 11, 2009. Christian Science Monitor. Glick, Daniel. The Big Thaw. National Geographic., September, 2004. Once again, a hat-tip to my amazing nephew and Vail resident Ray, who provided references. He has worked to help control the epidemic in his area. Plus he is the most amazing extreme skier I have ever seen in my life. He does things on skis that would leave me talking through an electronic voice box for the rest of my life, including, but not limited to being towed, on skis, by a galloping horse, my hand to God, and there is a photo.